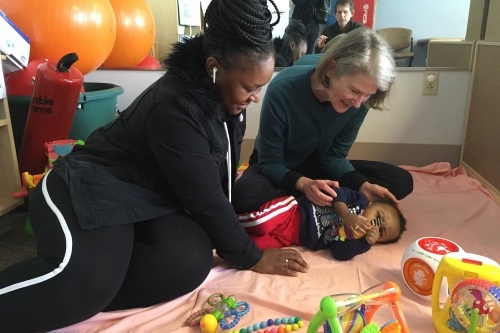 How occupational therapist Jamie Berggren helps infants recover from a potentially disabling nerve injury suffered at birth. Therapy is a bummer, Maurice could tell you. It’s his first teachable moment, and at 8 months old he’s receiving it on his stomach, a buffet of toys laid out before him an arm’s length away. If only a good breeze would kick up and blow a few toward him. Alas, no breeze can favor him here. He is indoors, at the Brachial Plexus Clinic at Children’s Hospital Los Angeles, under the watch of occupational therapist Jamie Berggren. Berggren is hoping Maurice will be so enticed by the toys that he will release his impaired right arm from his side and extend it toward them. Duplicating the home and clinic environment is part of the plan. Berggren says it’s the only way Maurice will overcome the weakness in his right arm, the result of a severe brachial plexus injury he suffered at birth. To stress that point, families of CHLA patients with an injury to the brachial plexus, a ribbon of nerves that triggers the movements of the arm and hand, are given a handout called “Environmental Redesign for Your Infant With Brachial Plexus Injury,” essentially a blueprint on outfitting your home in ways that will facilitate recovery. The brachial plexus starts in the spinal cord and crosses through the neck and shoulder area, stimulating the entire arm—shoulder, elbow, forearm—down to the hand. A difficult delivery, one that requires a lot of manipulation of the baby, as happened with Maurice, can cause the nerves to tear, or they may be stretched and after recoiling back into place form a neuroma, a bulge of nerve tissue that obstructs communication from the brain and the spinal cord to the muscles. More often than not—two-thirds of the time, Berggren estimates—the injury will work itself out, but after more than two months of therapy, Maurice’s arm wasn’t responding. It was “the deadest object,” Samantha says, always tucked behind him with his hand cuffed, a position Berggren says is called the waiter’s tip because it appears like the hand is waiting to be pressed by a $20 bill. “He didn’t even pay attention to it,” Berggren says. The lack of progress prompted the recommendation of surgery. Only a handful of pediatric hospitals have a surgeon capable of doing the precise microsurgery required to repair a brachial plexus nerve of an infant, which involves manipulating the nerve without clipping the brachial artery situated nearby. CHLA has several: Milan Stevanovic, MD; Mitchel Seruya, MD; Nina Lightdale-Miric, MD; and Erin Meisel, MD. Last November, Dr. Stevanovic and Dr. Lightdale-Miric operated on Maurice. He has a scar on the back of his right calf where they excised two pieces of functioning nerve, and another scar across his clavicle where they grafted the nerve segments as if laying down railroad track, creating a new passage to the affected muscles. Maurice hasn’t moved his shoulder or elbow yet, but that’s as expected. Berggren explains that he missed the first months of motor development when babies discover the connection between their brain impulses and their arm movements, so this early on the task is not to get Maurice to strengthen the muscle, but to recognize it. Typically, recovery begins in the shoulder and moves down, but Maurice’s muscles have responded in reverse, so Berggren is working her way up. It’s only in the past year and a half or so that CHLA has had a dedicated brachial plexus injury unit—two, in fact; one in Orthopaedics and the other in Plastic and Maxillofacial Surgery. Brachial plexus patients used to be routed through the hospital’s hand clinic. A whole team has now been assembled to enable their recovery, consisting of surgeons, neurologists, social workers, nurses and occupational therapists, with a nurse coordinator synchronizing everyone’s efforts. The microsurgery to repair the injury is also a fairly recent advance, Berggren says. 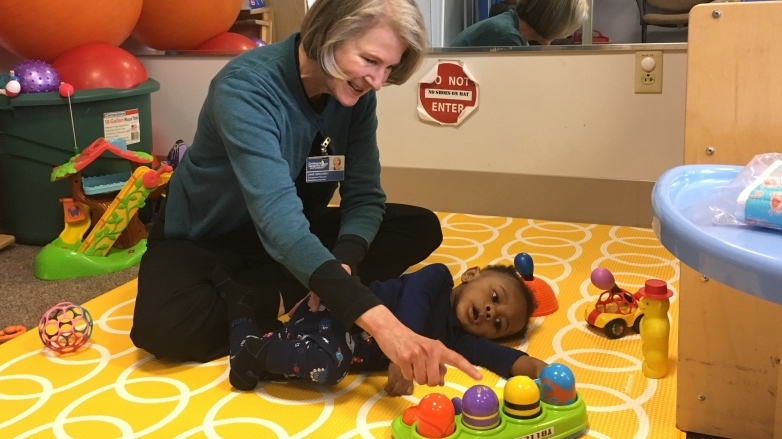 Now in her 29th year at CHLA as an occupational therapist, she used to see a lot of older kids in clinic whose injury predated the availability of surgery. The best that doctors could do for them were secondary interventions, such as transferring a tendon from another muscle to the shoulder or wrist, with the smaller goal of allowing the impaired side more movement. They weren’t repairing the nerve injury, but only lightening the consequence of it. She’s referring to portraits of the 19-century French emperor, who was often painted with his hand slid into his military coat, which has led some to guess that he had a brachial plexus injury. Another famous example is former Sen. Bob Dole, who suffered brachial plexus damage in World War II, disabling his right arm. Though he has never confirmed it, Berggren says any occupational therapist would tell you that actor Martin Sheen looks like he may have a brachial plexus injury. Sheen was often shown in his old TV series “The West Wing” putting on his suit jacket by first placing a sleeve over the presumably weakened arm and then whirling the coat over his head. It’s a dead giveaway, Berggren says. Eventually, Maurice will be thankful that his mother acted quickly before atrophy set in. Berggren explains that the torn nerve will rejuvenate and start nourishing the muscle with the help of the grafted nerve, but slowly. At the pace of a millimeter a day, the process needs a generous portion of time—and is on a deadline. Berggren says responsibility rests with the child’s pediatrician, who may not feel an urgent referral is warranted because the majority of brachial plexus injuries heal on their own. The clinic will follow Maurice till he’s 2, and if he hasn’t hit certain milestones he may need a second surgery. After that, you have about what you’re going to get, Berggren says. “Most patients don’t have significant disabilities using their arms and hands, but they may have differences. Of course, adorability doesn’t get him any nearer to the toys, which remain irresistibly close, imploring him to do the thing that will bear the most reward, now and long into his future: Reach! To help Children's Hospital Los Angeles continue life-changing work for kids like Maurice, consider making a donation. Visit CHLA.org/Donate.